This is part 2 of a 2 part article. We recommend you read part 1 first. “This is far too complicated!” the CEO exclaimed about the company’s flagship product—the product that produces 80% of their revenue. Until an easier-to-use competitor showed up and changed that. While the CEO may not know how his cash-cow product got so complicated, we do. The Market Maturity model predicted it. As we discussed in Part 1, our research shows there are four stages to a market. Every market for a product or service seems to go through the four stages, though some go through faster than others. It starts with the Technology Stage, where the customers don’t really care about how usable the design is, since what they hunger for most is the capabilities. If the capabilities are powerful enough, they’ll pay extra for the resources to train their folks on the most complicated of interfaces. Once there’s a competitor on the scene, the focus turns to the Features Stage. In this stage, the team’s priorities are all about building new and better features, while never letting the competition get ahead with any substantial differentiating features themselves. Features easily dominate the design strategy, making things feel very reactive, as requests come from all directions. If a product or service is useful, it will get customer attention. Once customers start paying attention, competitors will want to get some of that action, offering alternative features and capabilities. That will force the market leader to add more features and extend the design far beyond its original architecture. This is where the irony comes in: Becoming the market leader almost inevitably forces the company to destroy its own design. To remain competitive, the designers have to respond to the needs of the market, which happens hard and fast. Each response chips away at the architectural integrity of the original design—whose simplicity is probably what made it so appealing in the first place. It’s easy to pinpoint when the Experience Stage starts: customers stop focusing on new features and now start asking for simplicity. They are concerned about the costs of getting new users up to speed. They are complaining about paying for features they never use. What they want, they tell us, is something that gets the job done without the hassle of extra functionality. Weather reporting site, Accuweather.com, has been voraciously adding features. 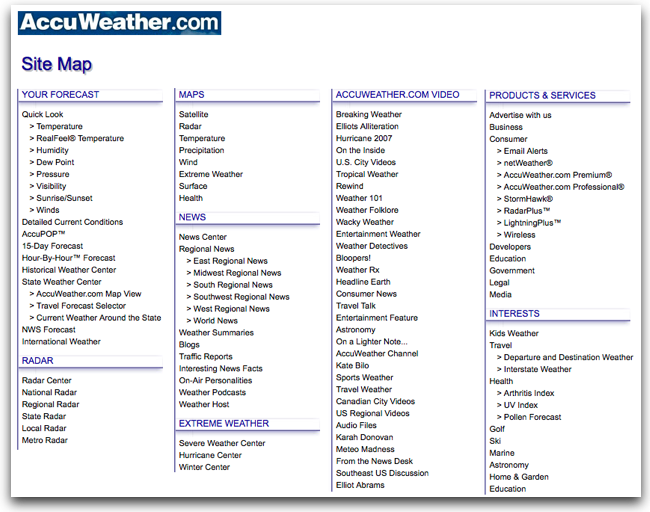 Trying to make itself the most in-depth resource for everything weather related, it ended up with a ton of features. Most of the time, all a user wants to know is a simple prediction. 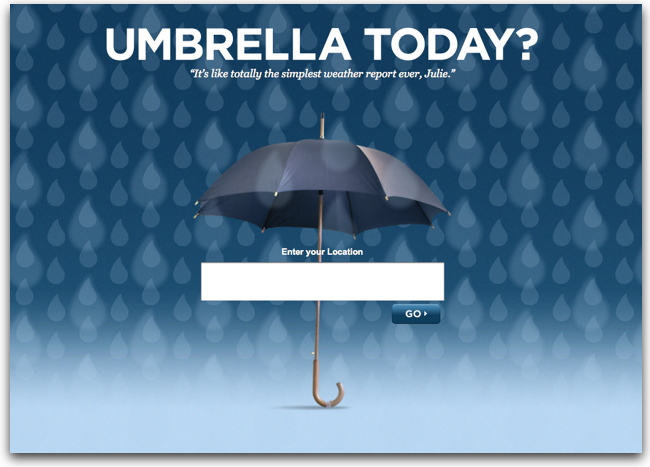 That’s where upstart UmbrellaToday.com comes in: go to the home page, enter your address and it responds with a big “Yes” or “No”, predicting whether you’ll need an umbrella today or not. No fuss, no muss. While this is an extreme case of simplification, it’s not far off of the pattern. Customers tire of bloated designs. Upgrades become more difficult to justify. The value of change isn’t clear. Preparations for Experience Stage have to start while focusing on new features in the Features Stage. The design team needs to understand what the critical features are for the users. They need a solid understanding of why users come to the design and what they need to accomplish with it. The emerging competitor’s designers will find this stage easier than the market leader’s team. They need to zealously focus on providing the least functionality, making the users’ experience ideal. For the market leader, this stage is more difficult. When the executives realize that they are losing market share due to the design’s complexity, the game is already lost. Therefore, the team needs to stay ahead by already having a strategy. The problem for the market leader’s design team is the giant hairball of functionality that they’ve amassed. Creating a simpler design is more than applying a “simple skin” to the complex functionality. The team needs to rethink user workflows and untangle optional functions. It’s in the Experience Stage that the flagship User Experience tools have the biggest return: Personas, scenarios, rapid prototyping, design patterns, and components will make this process much easier. A solid experience vision helps guide the wide-ranging players to a common destination. The place to start is the Out-Of-Box Experience (OOBE). Watching users’ first experiences with the design will help demonstrate what’s working and what’s failing; usually in a dramatic way to rally support at all levels. In the Commodity Stage, the things we’re designing are embedded into bigger experiences. Previously stand-alone applications, such as maps, text editing, calendars, and merchant processing services, now become part of other designs, as an integrated component. In this stage, the focus of the customer has shifted. No longer is the end user deciding whose design to use. Now it’s the integrator. APIs and customization are more important than the raw functions themselves. The designers at EventBrite have a big challenge: making their event booking service feel like a seamless part of the events they support. Turns out this is more difficult than it first looks. When an organization, say the popular militia group, the Appleseed Project, produce one of their Boot Camp weekends, they need an easy way for their constituents to register. 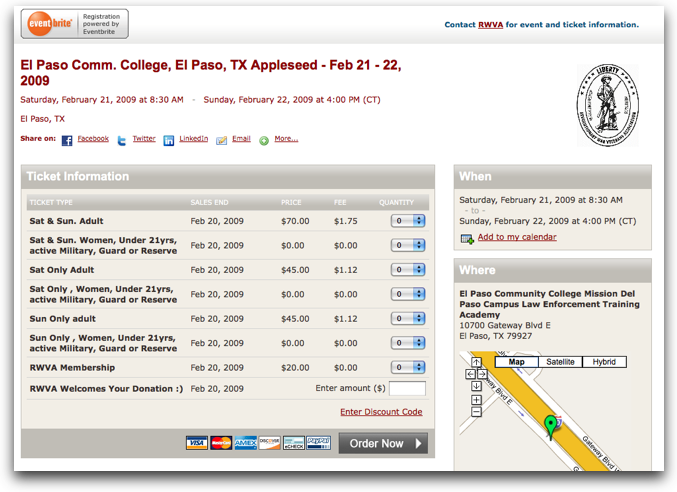 They turn to EventBrite’s registration system to handle the reservation and payment functions. 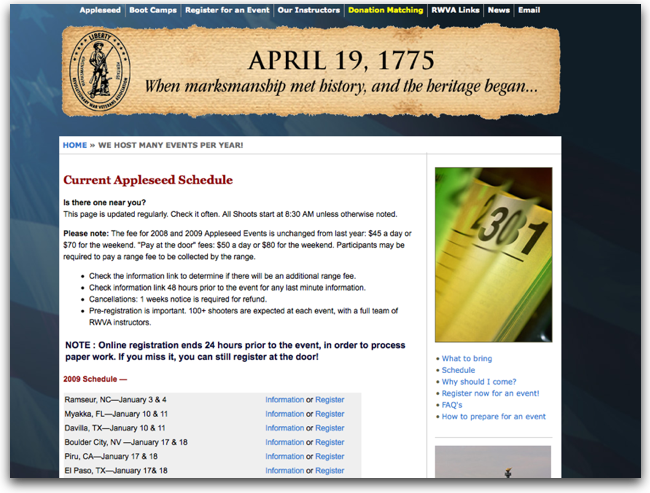 The Appleseed event schedule page has a distinctive look and feel. It matches the rest of the site, with the same color scheme, layout grid, and typography. Whether you love it or hate it, it is a very distinctive design. Clicking on the Register link for a specific weekend event brings you to EventBrite’s registration page. While consistent with other EventBrite pages, it’s radically different from the AppleSeed design. It’s a jarring change in the flow, potentially leading to confusion on many different levels. In the Commodity Stage, the challenge is to shift away from the distinctive look-and-feel of the stand-alone design. Now the design team needs to understand how the integrator wants to embed elements. They need to determine what will need customization and what must remain the same to be functional. Understanding the experience of using the API and other protocols, along with how to build a seamless experience when you know all the places your design will be integrated, is the big hurdle to overcome. In our research, the most successful teams have a keen awareness of the stage they are currently in and what it takes to transition to the next. Their thinking keeps them on target, creating designs that match the maturity of the market while understanding that things don’t stay the same forever. Published here on August 19, 2009.